Image caption Is there evidence to back up claims that flossing is good for you? For decades dentists have recommended flossing as an essential part of oral hygiene. But how useful is it really? An investigation by the Associated Press has revealed there is insufficient proof to back up this claim. The US Department for Health and Human Services and Agriculture admitted in a letter that the benefits of flossing had never been properly researched. A British dentist at the University of Birmingham, Prof Damien Walmsley, also said there is only "weak evidence" to suggest flossing is beneficial. But in a statement released Tuesday, the American Dental Association (ADA) vigorously defended flossing, saying it was an "essential part of taking care of your teeth and gums". Why do dentists say flossing is good for you? Many dentists have said flossing can help remove plaque, food build-up between the teeth, reduce the risk of gingivitis, gum disease, and reduce the risk of tooth decay. In its statement the ADA said: "Cleaning between teeth removes plaque that can lead to cavities or gum disease from the areas where a toothbrush can't reach. "Interdental cleaning is proven to help remove debris between teeth that can contribute to plaque build-up." This advice is echoed by the UK's National Health Service on its website: "Dental floss helps to prevent gum disease by getting rid of pieces of food and plaque from between your teeth." The studies backing up the ADA's claims are outdated and only surveyed a small number of people, according to AP. Evaluations of the other studies conducted in the past ten years, found evidence for flossing was "unreliable", "very low quality" and there was even "a moderate to large potential for bias". One review conducted last year said: "The majority of available studies fail to demonstrate that flossing is generally effective in plaque removal." Prof Walmsley, who is also a scientific adviser to the British Dental Association, said: "The difficulty is trying to get good evidence. People are different and large studies are costly to do... until then you can't really say yes or no." He said "more sophisticated trials" were needed. When did recommendations for flossing start? The American Dental Association started promoting flossing in 1908. A dentist in America, Levi Spear Parmly invented flossing in the early 1800s. The first floss was patented in 1874 by which time dentists were recommending the practice. Currently in the US, studies which evaluate the benefits of flossing can be funded and directed by flossing manufacturers. 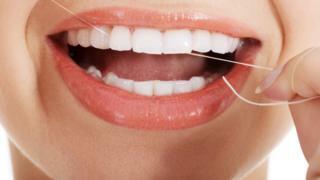 Two major floss producers, Procter & Gamble and Johnson & Johnson have both said that flossing helps to remove plaque. But AP revealed that evidence used in Procter & Gamble's statement was discredited in 2011. And Johnson & Johnson declined to respond to the news agency after being shown research that refuted their claims. If done improperly, flossing can cause damage to gums, teeth, and dental work, according to the AP investigation. Sometimes, flossing can also cause harmful bacteria to be released into your bloodstream which could lead to an infection. Is cleaning between your teeth beneficial? Yes. Even sceptics of flossing say cleaning between your teeth is good for you. A Dutch periodontist who has conducted flossing studies says he uses a toothpick. The British Dental Association said: "Small inter-dental brushes are best for cleaning the area in between the teeth, where there is space to do so. "Floss is of little value unless the spaces between your teeth are too tight for the interdental brushes to fit without hurting or causing harm." US National Institutes of Health dentist Tim Iafolla said when purely looking at the science "it would be appropriate to drop the floss guidelines". But he also said people should still floss. "It's low risk, low cost. We know there's a possibility that it works, so we feel comfortable telling people to go ahead and do it." Several other countries still recommend flossing: the Argentine Ministry of Health, for instance, says people should "clean between all your teeth everyday with dental floss or a similar product". And the Australian Dental Association recommends that all people over 11-years-old should floss. "Flossing ... is an essential part of caring for your teeth and gums, and not some kind of 'nice to have' added extra."